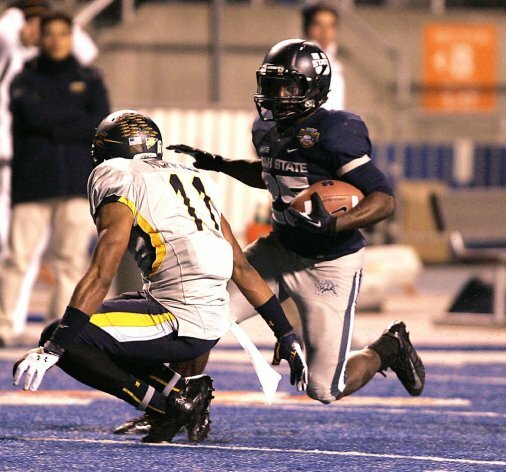 Tyler Slavin’s 2-yard touchdown catch sealed the victory for the Wildcats over the Wolfpack in a thriller. Kerwynn Williams ran for 235 yards and 3 touchdowns as the Aggies trounced the Rockets. Kyle Van Noy’s 17-yard interception return and fumble return sparked the Cougars to a win over the Aztecs. Latavius Murray ran for 71 yards and 2 touchdowns and caught a 5-yard touchdown pass as the Knights took care of the Cardinals. Terrance Broadway threw for 316 yards and a touchdown and ran for 120 yards and a touchdown as the Ragin Cajuns stole one from the Pirates. Michael Frisina’s 27-yarder gave the Broncos a two point win over Huskies. Garrett Gilbert threw for 212 yards and a touchdown and ran for 98 yards and a touchdown as the Mustangs trampled the Bulldogs. Ryan Radcliff threw for 253 yards and 3 touchdowns as the Chippewas squeaked one out against the Hilltoppers. 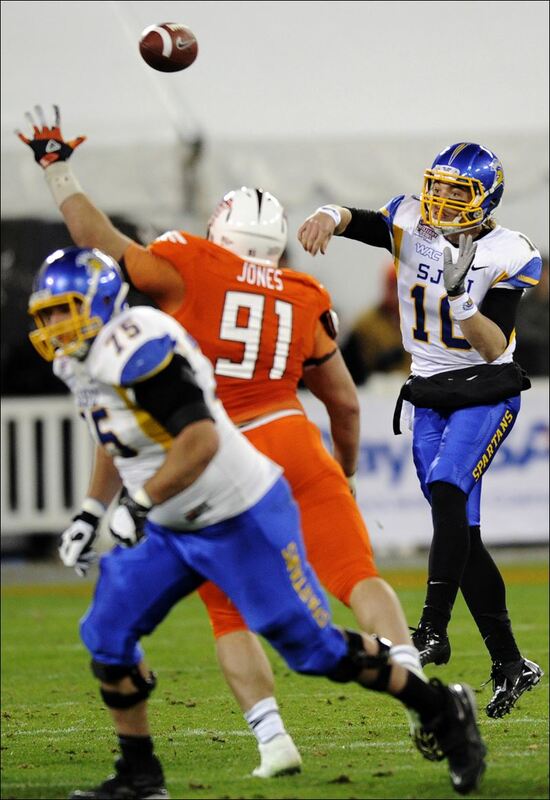 David Fales threw for 395 yards and 2 touchdowns as the Spartans speared the Falcons. Travis Kelce had 5 catches for 123 yards and a 83-yard touchdown pass as the Bearcats bit the Blue Devils. 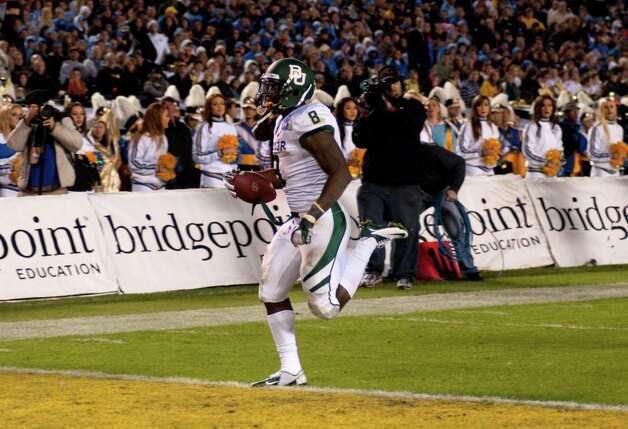 Glasco Martin ran for 98 yards and 3 touchdowns as the Bears mauled the Bruins. Beau Blankenship ran for 104 yards and 4 touchdowns as the Bobcats clawed the Warhawks. 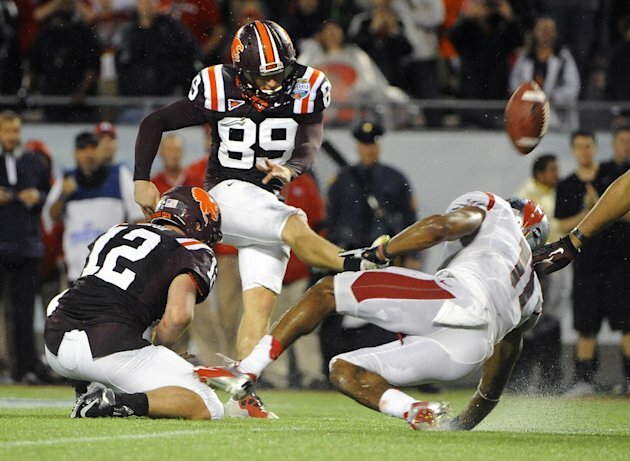 Cody Journell’s 22-yarder gave the Hokies an overtime win over the Scarlet Knights. Ryan Bustin’s 28-yarder capped an epic battle between the Red Raiders and the Gophers. 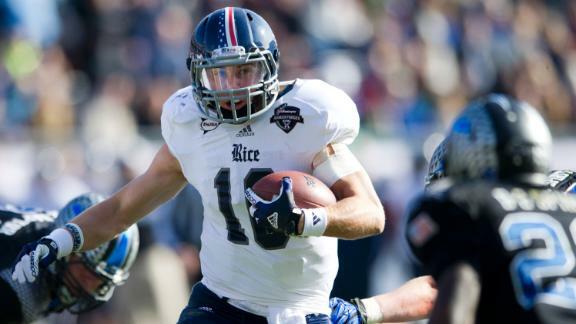 Jordan Taylor had 9 catches for 153 yards and 3 touchdowns as the Owls spooked the Falcons. 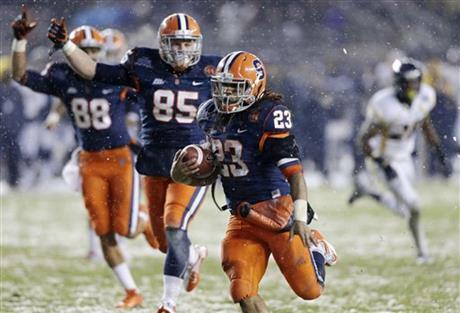 Prince-Tyson Gulley ran for 208 yards and 2 touchdowns as the Orange demolished the Mountaineers. Taylor Kelly was 17-19 for 268 yards and 4 touchdowns as the Sun Devils burned the Midshipmen. David Ash threw for 241 yards and 2 touchdowns as the Longhorns sneaked out a win over the Beavers. Le’Veon Bell ran for 145 yards and a touchdown as the Spartans slayed the Horned Frogs. Zac Stacy ran for 107 yards and a touchdown as the Commodores defeated the Wolfpack. Tevin Washington threw for 49 yards and a touchdown and ran for 46 yards and a touchdown as the Yellow Jackets stung the Trojans. Alex Singleton ran for 35 yards and 3 touchdowns as the Golden Hurricane blew away the Cyclones. Chandler Catanzaro’s 37-yarder helped Clemson roar past the Tigers from Baton Rouge. 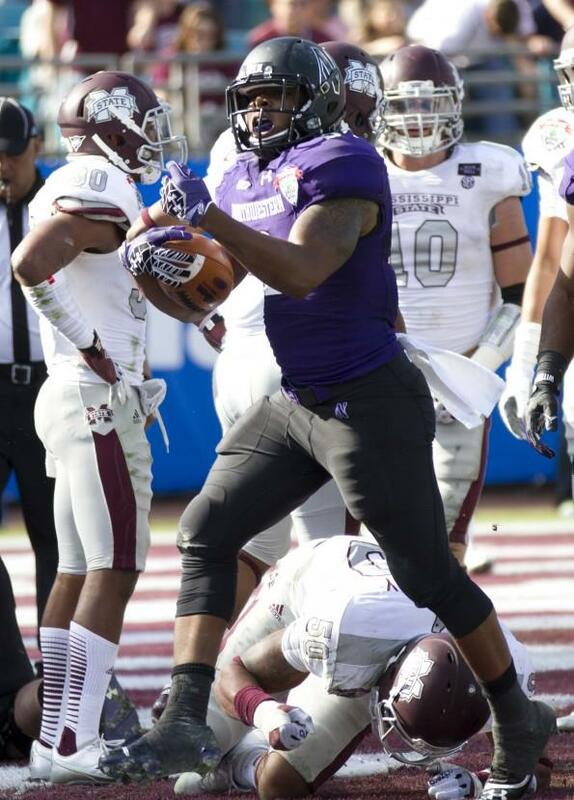 Tyris Jones only ran for 14 yards, but his 3-yard touchdown was the winning score for the Wildcats over the Bulldogs. Northwestern snapped a 69-year bowl losing streak with the win. Clint Chelf threw for 197 yards and 3 touchdowns as the Cowboys lassoed the Boilermakers. 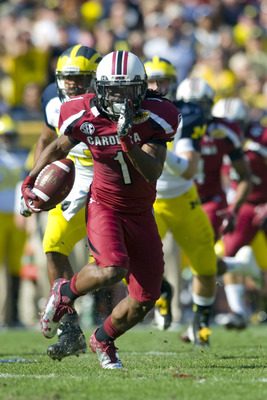 Ace Sanders had 9 catches for 92 yards and 2 touchdowns and a 63-yard punt return as the Gamecocks pecked the Wolverines. Aaron Murray threw for 427 yards and 5 touchdowns as the Bulldogs nipped the Cornhuskers. Stepfan Taylor ran for 88 yards and a touchdown as the Cardinals flew past the Badgers. Lonnie Pryor ran for 134 yards and 2 touchdowns on only 5 carries as the Seminoles neutered the Huskies. 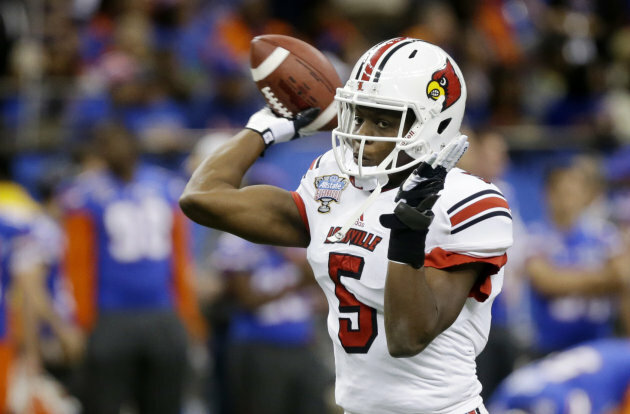 Teddy Bridgewater threw for 266 yards and 2 touchdowns as the Cardinals pecked the Gators. De’Anthony Thomas had 4 catches for 60 yards and a touchdown and a 94-yard kickoff return as the Ducks quacked the Wildcats. 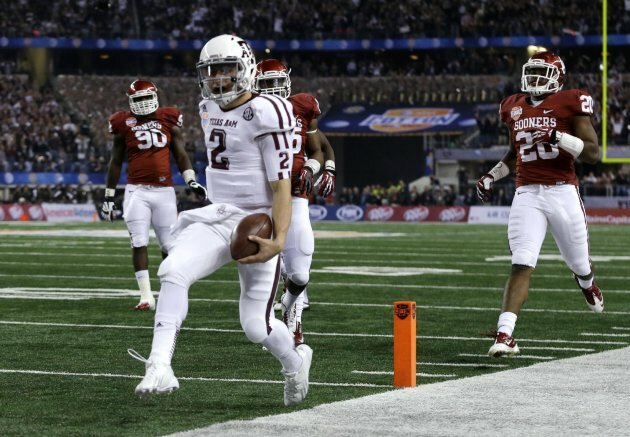 Johnny “Football” Manziel threw for 287 yards and 2 touchdowns and ran for 229 yards and 2 touchdowns as the Aggies rolled the Sooners. Bo Wallace threw for 151 yards and 3 touchdowns as the Rebels dominated the Panthers. J.D. 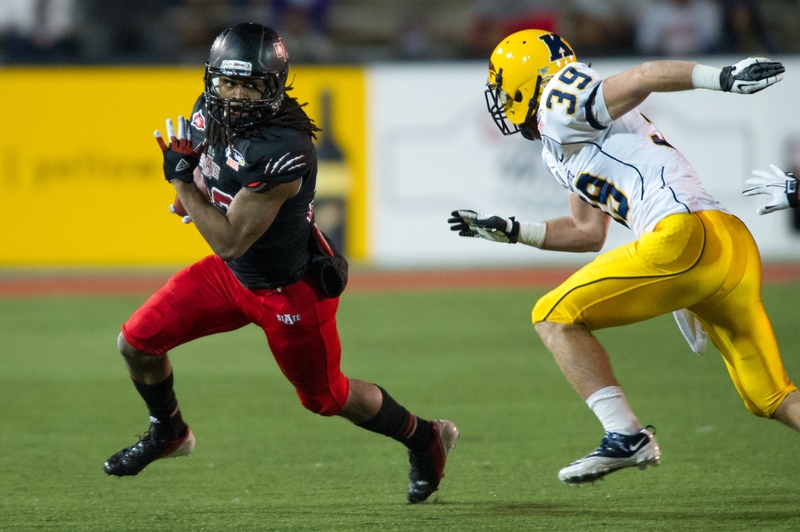 McKissic caught 11 passes for 113 yards and a touchdown as the Red Wolves mauled the Golden Flashes. A.J. 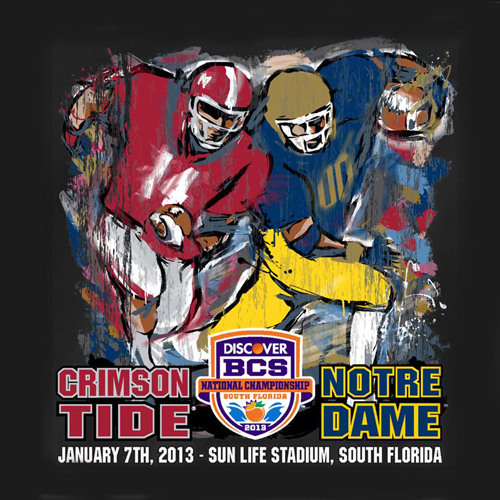 McCarron threw for 264 yards and 4 touchdowns as the Tide rolled the Irish. Eddie Lacy ran for 140 yards and a touchdown as the Irish defense had no answer for him. C.J. 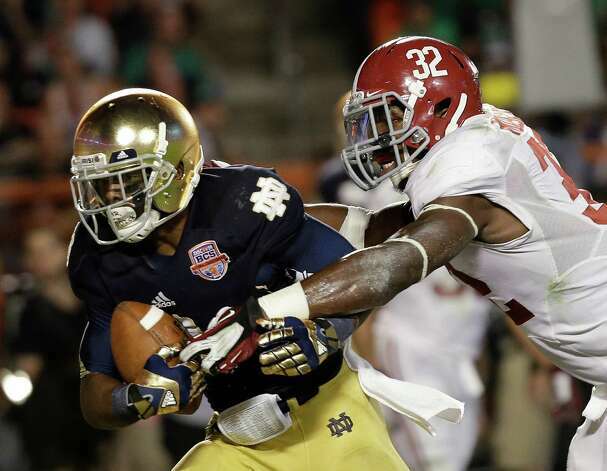 Mosley was a nightmare for the Irish offense as he had 8 tackles and a sack for the Tide. 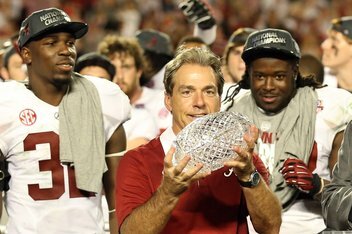 Alabama captured their 3rd BCS title in 4 years. This entry was posted in NCAA Football and tagged ACC, Air Force, Alabama, Arizona, Arizona St, Arkansas State, Ball State, Baylor, BCS, Big 12, Big East, Big Ten, Boise State, Bowling Green, BYU, Central Michigan, Cincinnati, Clemson, Conference USA, Duke, East Carolina, Florida, Florida State, Fresno St, Georgia, Georgia Tech, Iowa St, Kansas State, Kent State, Louisiana, Louisville, LSU, MAC, Michigan, Michigan St, Minnesota, Mississippi State, Mountain West, Navy, NC State, Nebraska, Nevada, Northern Illinois, Northwestern, Notre Dame, Ohio, Oklahoma, Oklahoma State, Ole Miss, Oregon, Oregon State, Pac 12, Pittsburgh, Purdue, Rice, Rutgers, San Diego St, San Jose St, SEC, SMU, South Carolina, Stanford, Sun Belt, Syracuse, TCU, Texas, Texas A&M, Texas Tech, Toledo, Tulsa, UCF, UCLA, UL Monroe, USC, Utah State, Vanderbilt, Virginia Tech, WAC, Washington, West Virginia, Western Kentucky, Wisconsin. Bookmark the permalink.